I am on yet another quest to replace mayonnaise in a classic recipe. As I’ve explained before, store bought mayo isn’t exactly real food (and making mayo from scratch isn’t exactly my cup of tea). 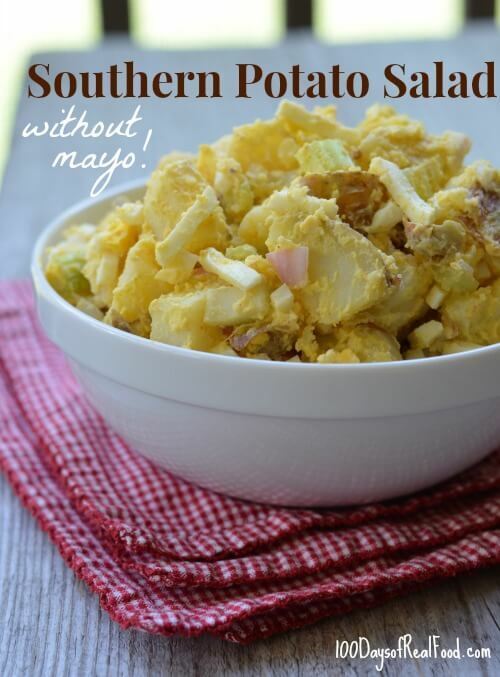 Plus not everyone is a mayonnaise lover anyway, so just in time for your holiday BBQ, here is my (non-mayo) Southern Potato Salad recipe that is just as good as the original! Cut the potatoes into 1 1/2" to 2" chunks (with the peel left on). Bring a medium pot of water to a boil. Add the potato pieces and eggs (in the shell) to the water and set to a light boil for 15 minutes. If after 15 minutes the potatoes are not tender when pierced with a fork, then remove the eggs and continue boiling the potatoes for a few minutes more. When finished drain and run cool water over top of the eggs and potatoes. Meanwhile, dice the celery and onion and add to a large mixing bowl. In a separate smaller bowl, whisk together the sour cream, mustard, melted butter, salt, paprika, and pepper. Set aside. Dice the cooked potatoes into smaller 1/2" pieces and add to the large bowl. Peel and dice the eggs (I use one of these slicers to cut the egg longways and then crossways for a quick dice) and add to the large bowl. Pour the sour cream mixture over top and toss to combine. Serve immediately or refrigerate for up to 5 days. Previous Post: « Cookbook Bonus for Preorders! It’s not a traditional potato salad, nor is it a budget-friendly recipe, but you get the added health benefits of avocado. My toddler loves, it, too, if I leave out the jalapeno. I love that you don’t use mayo in this recipe! I’ll have to keep it in mind for later. Do you think greek yogurt would work in place of the sour cream? I almost always have greek yogurt on hand, but don’t buy sour cream that much. I love how you cook the potatoes and hard boil the eggs together. It saves a dish, saves time & heats up the kitchen a bit less. Why didn’t I think of that before? I’m not a fan of store bought mayo either. This potato salad looks delicious! Is it ok to use Greek yogurt to replace the sour cream? you can use plain Greek yogurt in place of sour cream. I do it all the time. Lisa Marie, I would love to try your recipe. My email is [email protected]. Della, Linda, and Jessica, here ya go! Whiz it around on low and -slowly- add 1/2 c. olive oil. (I use the lighter flavour olive oil so my mayo doesn’t taste olive-y.) Give that a bit of whizzing to breakdown the proteins in the yolks. Slowly add more olive oil (usually about 1 1/2 c.) until you get the consistency you want. I know mine’s ready when I can stand a spoon in the mayo without it falling over. And… that’s it. Really easy. – The only other oil I’d recommend for this is safflower, but even that isn’t as good as light-flavour olive oil. Other oils totally pale in taste. – You can sub apple cider vinegar for the lemon juice. It works, but has a different taste. – Add roasted garlic or hot sauce or homemade mustard for cool dip variations. – Makes a REALLY good ranch dressing. Mix equal parts mayo with plain whole milk yoghurt, chives, onion powder, garlic powder, and salt. Any other questions, feel free to email me at lmlindenschmidt(at)gmail.com. Lisa, i would love your recipoe. We have milk allergies and do not eat too much sour cream. Laura, I just substitute one to one for the mayo. Another idea: baked potato salad (think chopped baked potatoes, plain whole milk yoghurt, salt, pepper, and dried chives)! Good luck! Is butter considerd real ?? Yes! Best to choose a grassfed butter (like Kerrygold)! Very ‘real’ and very tasty! Totally! We have a ton of farms and natural foods stores around here that carry it. It can range in price from $6-$9/pound. Sounds expensive, but if I buy it in bulk (10 pounds at a time), my farmer will sell it to me at $5/pound. Totally worth it. And I encourage you to get creative with other spreadables like Jennifer suggested above. In addition to ghee and coconut oil – which are lovely – I also use bacon or roast drippings. Depends on what you’re doing with it. I just made this recipe and just like every other recipe I have tried from 100 Days it was fantastic! 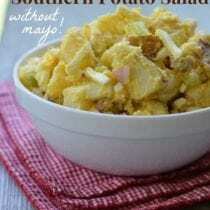 I think I like it better than traditional potato salad! Thank you for another great recipe! Very easy to make homemade mayo like those above have mentioned, but if you’re just not into that, Tessamae’s now carries a ‘clean’ mayo with no funky oils or sketchy additives! Love the blueberry jam and can’t wait to make it!!! This potato salad sounds delicious, but many in my family are dairy intolerant, so I love to make German potato salad which calls for olive oil and vinegar,salt and pepper and lots of diced up red onion and celery in the diced potatoes. You throw on the dressing while the potatoes are still warm.This is a good alternative for those who can’t tolerate dairy products such as sour cream. Made this for the 4th of July with a few tweaks. (No onions–I hate onions; no pepper–I hate pepper.) It was delicious. Even my husband ate it, and he usually hates any new food I make. Told me I could win a contest with it. Bravo! Sarah- your post made me laugh out loud. “I hate onions. I hate pepper.” So honest! Me too, and I’m glad your husband ate it. I hope mine does too. This recipe is so delicious! Thank you! Just pinned this! It looks delicious. I also really like that it doesn’t call for any mayo. Definitely a step in the right direction for me trying to eat healthier! Can’t wait to try out the recipe! I really wanted to share an article about wal mart ice cream sandwiches not melting even while being left out for over 24 hours! The news team did a comparison test and found that another ice cream bar which had more “real” ingredients still melted! Didn’t know how else to share..
My husband is Swiss and he doesn’t go for the whole mayo thing in potato salads. I make mine with a veggie or chicken broth base. After the potatoes cook and cool down a bit, I peel them and slice them thick into a bowl. Then I add slightly warmed broth to the potatoes so they absorb the liquid which gives great flavor. Stir it up a bit and let it sit a while covered with a towel. Then add in some extra virgin olive oil, vinegar (we love herb vinegar), mustard, salt and pepper if you wish and mix it all together. The potatoes will break doen slightly and it will all come together. If it seems too thick, add a little water. I’ve see people add a little pickle juice too! Hello – I cant find this in your recipe index, can you add it? thank you! this is a great salad!!! Will this recipe freeze? I want to freeze my leftovers to add to lunches in the future. This potato salad looks great. I will have to try it! Yes, it has a more than 5 ingredients, but all the ingredients meet the definition of real food. And while there is sugar on the ingredients list, it’s such a small amount that the amount of sugar per serving comes to 0 g. It’s a great option for those who don’t want to give up mayonnaise and don’t have the time or inclination to make their own. Chosen Foods Avocado Oil Mayo is another great option. No refined sugar, cage free eggs, no refined oil, and really yummy! Try Duke’s mayo, it has no sugar and is a natural. Ok I don’t work for Duke’s Mayo but this story must be told. My parents were missionaries for years in East Aftica. All my dad asked for (for Christmas) was Duke’s. I was robbed a week before my flight and all gift packages were ripped open and the gifts worth money were stolen, all dad cared about was getting the Dukes. He’d waited a year. Never again! Southern and daddy’s girl :) … still loving Duke’s Mayonaise all over the globe! Soybean oil, eggs, water, distilled and cider vinegar, salt, oleoresin paprika, natural flavors, calcium disodium EDTA added to protect flavor. Soybean oil is horrendous for anyone’s health, natural flavors are anything but natural, Calcuim disodium -Ethylenediaminetetraacetic Acid. Found in: Processed foods. Robs Your Body of: Vitamin C, magnesium, iron, calcium, zinc, potassium. Sorry, I would never use Dukes Mayo. Ethylenediaminetetraacetic Acid: chelates mercury and lead; acts as an antioxidant; used by dentists during root canals; anticoagulant; reduces bacterial growth. Having thirteen syllables doesn’t make it dangerous. I love Duke’s mayonaise. There is no natural in Duke’s mayo. And absolutely nothing healthy in it in any way. Amazing how people are duped into believing something is natural. Actually, sugar would be healthier that what is in Duke’s mayo. I tend to use whole milk Greek yogurt to replace mayo in most recipes. If you let it sit over night the flavours develop more. works a treat for flavored dips. Adding spices etc for curry dip. just make sure it’s proper greek yogurt. No thickeners or gellatines. Should only contain milk ans cultures in the ingredient list. That’s it. I started this yesterday and we ate it for dinner tonight -it was delicious! My husband and three-year-old both enjoyed it too. I was afraid my potatoes were overcooked, since they were falling out when I drained them, but after a night in the fridge, they held together perfectly! My only question : any thoughts for mustard substitutions? I just left it out, which worked fine, but if there’s something else I could use, I’m game for it! I absolutely hate mayo, miracle whip or anything like them! You have no idea how excited I am to find this recipe. I will certainly be trying it out. Thank you for posting.